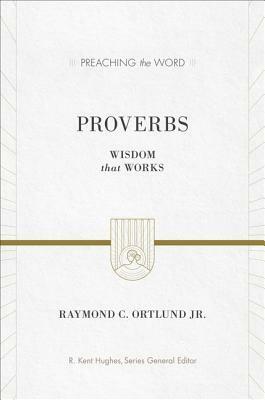 Proverbs: Wisdom that Works, by Raymond C. Ortlund Jr. 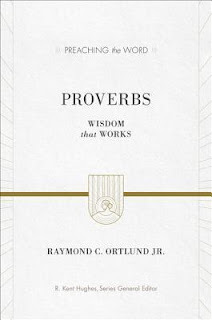 I think every Christian should own a copy of Proverbs: Wisdom that Works and - to take this book the extra mile - I think everyone should read this book as well. Had I the funds, I told Jonathan I would be interested in purchasing a copy of this book for everyone I know. Wisdom correctly applied is life changing. Although this book is a set of 21 sermons on the the book of Proverbs, it is not in the least bit dry and dull. Ortlund's style is very engaging and in-your-face. When I say it is "in-your-face" I do not mean to apply that he is heavy handed in his approach of why Proverbs is important but that he removes any wiggle room you have created for yourself to make excuses as to why you are just naturally and miraculously smarter than God. In some ways, this book is enormous fun to read. Quite frankly, I ate it up. But then, reading about gaining wisdom is way more comfortable than going through life circumstances which force you to learn how to correctly apply it. (I do wish I had read this book several years back, however.) I think perhaps the reason why I found this read to be so terribly fun (in the most accurate sense) is that Ortlund is extremely forthright in expressing the joyous beauty that is wisdom while being bluntly honest that application is difficult. However, when he explains the difficulties in application, he removes any excuses you might think up to avoid seeking it out. He tells you point blank that following Jesus and obeying him is a perfectly terrifying experience but that wisdom also requires trust in the Lord. Trust is a particularly hard one for me, personally. I'm a very cautious person (now) when it comes to building and maintaining relationships. I fret and worry about blow-ups. I try desperately to avoid them. Reading this book fueled my confidence in Christ -- to know that "doing the right thing" may mean occasional pain and discomfort, but that I can trust the Lord with the outcome. And sometimes, "doing the right thing" simply means keeping my mouth shut without worrying that my not saying anything will result in some sort of evil. Removing fear from the equation of any relationship, starts to breathe life into it, yes? "In our daily lives we need more than rules. Sometimes life is too complex for a simple rule. We need wisdom to fill in the blanks moment by moment, and God gives us His wisdom in the book of Proverbs. But we need wisdom for another reason. It is possible to live by all the rules and be ugly about it. We have all known people who were blameless, in their way, and we disliked them. But wisdom "will bestow on you a beautiful crown" (Proverbs 4:9). We want Jesus to place that crown on our heads, for His sake. Wise Christians and wise churches become radiantly attractive. I have so many passages in this book marked. I could quote from it extensively but this post would then be longer than you likely have the patience for. That in itself is going to be the problem for most readers - learning about doctrine and scripture and wisdom seems too dull and impractical to many of us. But what, I ask you, could be more practical as a Christian than to deepen your understanding of Who God is? "Let's not underrate what we have here in the book of Proverbs. Biblical wisdom is more than what we find in a fortune cookie. it is more than an optional add-on for people who want to upgrade their lives from, say, 4 to 7 on a sale of 1 to 10. This wisdom from Christ is a matter of life or death. "The teaching of the wise is a fountain of life, that one may turn away from the snares of death" (Proverbs 13:14). What if we have many advantages in our lives but not wisdom? If we have love but not wisdom, we will harm people with the best of intentions. If we have courage but not wisdom, we will blunder boldly. If we have truth but not wisdom, we will make the gospel ugly to other people. If we have technology but not wisdom, we will use the best communications ever invented to broadcast stupidity. If we have revival but not wisdom, we'll use the power of God to throw the church into reverse gear. I'd like to write up an entire post on the subject of gossip alone, which seems to be the bane of my existence. I hate it and I really think we women, in particular (but sometimes the men!) really need to pay attention to it. It's destructive, ugly and did I mention destructive? I found Ortlund's approach to it to be the most hard hitting of any author I've read yet -- because he calls it like he sees it and applies to the Word of God to his remarks. But Ortlund manages to do that with each subject he addresses which makes this a most excellent book, in my opinion. I give this one 10 stars (you know, . . . if I were in the habit of giving stars.) There is really no excuse for the Christian not to read this one, and I found it to be a very valuable tool in stretching my faith and strengthening it at the same time. It's a win-win reading situation! Thank to Crossway Books for providing a copy of this book in exchange for my honest thoughts. Thank you so much for this great review. It looks like an amazing book!! Going to buy it! I love this book simply based on your review. When you highly recommend something it goes straight onto my ever growing book list! I love Proverbs. I think I would really enjoy reading and benefit from this one. Thank you for callling my attention to it! You convinced me. Going to explore if there are others like it, too. Maybe Christmas gifts? Thank you for pointing us to this book! I think I will go get it! Definitely sounds interesting. The book of Proverbs never grows old to me. Carrie, I am going to pick up a copy of this book. My husband loves to read from Proverbs for worship so I think we'll both take a lot from it.